All Rio Track athletes are invited and encouraged to continue to train with their Track & Field teammates who have advanced on to The Sac Joaquin Section Preliminaries and Finals Meet. 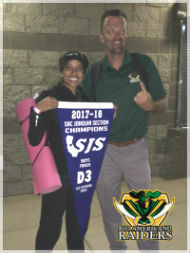 The practice schedule is for the athletes who have made it the Sac Joaquin Section Preliminaries and those athletes who wish to continue practicing along with them. We have over 20 Rio Americano Student Athletes that have advanced to Sections! Continue reading by opening the Rio Track and Field Weekly Update PDF for Monday, May 14, 2018. We will have our 2018 Track & Field Banquet on Wednesday, May 23rd from 6:00 to 8:00 p.m. in the Rio Cafeteria. We will be having food catered from Serritella’s Italian Restaurant & Pizzeria, the cost is $10 per person. Please complete the banquet form and send it with your athlete so we can order enough food for everyone. We would like everyone to join us for this celebration and understand that the cost may be an issue for some families. If this is a concern please have your athlete speak confidentially with their coach. We want all our athletes to celebrate their accomplishments and be recognized together at the Banquet. The Cross Country Team will have a pizza night on Saturday, June 9th from 5:30 to 7:30pm at Roma’s pizza (6530 Fair Oaks Blvd, Carmichael, CA). Please RSVP to antonescay@hotmail.com. This no host event will be a fun evening where the coaches and kids can get to meet and learn about the plans for the upcoming season. We would also like to see how many kids are interested in a Tahoe/Donner trip during the Summer. It will be on Friday to Sunday, July 20-22. The cost will be $100 per Student Athlete. Email Anton for details or plan on attending on the pizza night on June 9th. Summer conditioning starts on June 18th and will be held every Monday, Wednesday, and Friday from 6 to 7:30pm meeting in the Bella Bru parking lot. Summer Conditioning is, of course, not mandatory, but is a great way to stay in shape over summer and run with your friends and team mates! Hey Rio Runners! Meghan, Natalie, and Lauren are buying coaches gifts for this track season and they need your help! Please meet them to bring your contribution after school on Tuesday where track practice starts (the snack bar next to the track). If you can’t make it Tuesday any day at school when you see them works great too. We are asking for a contribution of $20, but whatever you can contribute is greatly appreciated! Thank you so much and see you all at the banquet!